Perun stood at the top of a sloping, narrow path cut into a steep plateau. It was not yet dawn, and the valley below her was foggy and dark. In answer, Perun pointed into the valley. A red light had appeared. The mayor let out a wail. "Segoth will kill us all. Or worse, he'll leave us to the Fallen." The mayor looked at Perun and the two Titans standing on her other side. Then she turned and ran back into the village. The red lights were larger; already the faint, choppy whine of repaired Pikes filled their ears. "Nine of them," said Saladin. Radegast looked at her. "The north and south roads are undefended. If they change course—"
"It's about making people afraid— of Segoth, and of us. Seeing his goons coming a ways off, knowing he's coming for blood... the dread is part of the punishment. Anyway, he doesn't expect we'll still be here. So he takes the west road, 'cause it's the most visible, and the most direct." Radegast frowned. "Then it's time to show Segoth that his tyranny will end." "Not just Segoth," said Perun. She jerked a thumb toward the ruins behind her. Watchful faces poked out of windows and around tarps. "We gotta show them." The three of them picked up large, rough-hewn metal shields. Behind their shields, each held a worn rifle, wrapped with cloth and chain mail. The Pike-riders' faces were now visible through early morning gloom. A man in long red robes pulled his Pike ahead as they screeched to a halt. “Cease your insults,” Saladin barked. A hail of bullets slammed into their shields. Perun, Radegast, and Saladin slid backwards on the dusty path. But they dug in their heels, and the shields held. Trapped in the narrow path, Segoth and his warriors fell one by one. Perun, Radegast, and Saladin reloaded and then Segoth was up again, his glowing Ghost at his shoulder. He fired wildly, and a bullet struck Radegast in the head. "Got him!" Perun shouted as Radegast collapsed. 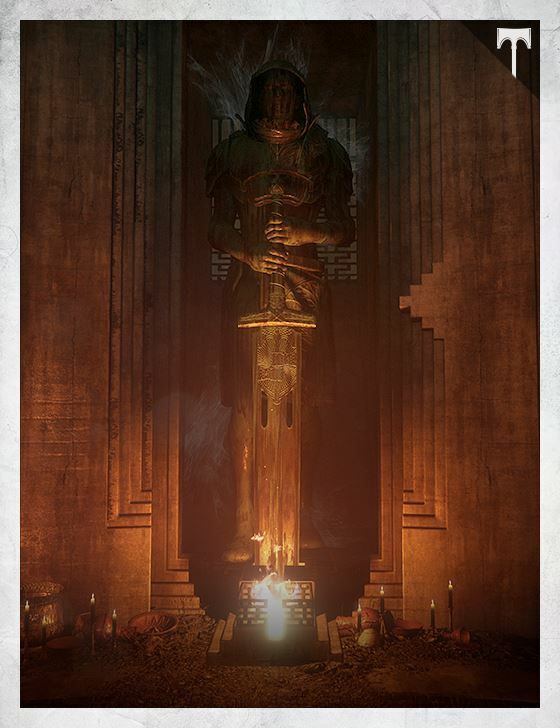 Perun, Radegast, and Saladin died many more times than any one of Segoth's men. But any time one of them fell, another would cover them until they staggered to their feet again. The shield wall held. The three gave no ground. Finally, his robes singed and ragged, Segoth signaled a retreat. “Iron Wolves!” he shouted as his warriors scattered and a cheer went up from the people in the silver ruins. “I will slaughter everyone who has ever sheltered you!" In answer, Perun shot him again.